The compressor program must respect the folder structure while unzipping. Maybe I did express wrong. I was not talking about GTK Radiant configuration pages in our wiki which aren't clear (well, they actually do have issues, but was I was not talking about that).... I meant "my OA folder on that PC isn't clean", meaning it has got extra files (my mistake, I typed "clear" instead of "clean"). Okay, now I got what you meant ("preserve paths" while uncompressing). That part is not the problem. Afer I placed oa.game data into GTK Radiant folder, launched the program and selected OpenArena, it asked to me the path of the game. I tried to select the folder where I had OA 0.8.8 installed... but it did not recognize it as valid (did not find the engine)... then I entered the "baseoa" folder under it, and went further instead (strange, considering "baseoa" folder does not include "openarena.exe" file). But then, I realized it automatically created another "baseoa" folder inside "baseoa" (it created c:\openarena-0.8.8\baseoa\baseoa\maps\ and c:\openarena-0.8.8\baseoa\baseoa\scripts\). Then I had to locate where GTKRadiant stores its settings (%appdata%\RadiantSettings\1.5.0\oa.game\local.conf) and manually edited "EnginePath" line to point to "c:/openarena-0.8.8/" instead of "c:/openarena-0.8.8/baseoa/" as before... and everything worked correctly then (it created c:\openarena-0.8.8\baseoa\maps\ and c:\openarena-0.8.8\baseoa\scripts\ then). Update: I checked again, and tweaking local.conf file did NOT really fix the issue. I launched the editor again and it re-created "baseoa/baseoa" folders. Opening local.conf again, it automatically re-added /baseoa/ by itself also there. Then I edited also "C:\Program files\GtkRadiant 1.5\games\oa.game" file, and modified "enginepath_win32", making it point to "C:/openarena-0.8.8/". And this time, it seems to work. PS: about this gamepack from NK, are you sure the "copying" file there is good? I mean, it's not in the oa.game folder, so if one uncompresses the whole zip in gtk radiant folder, "copying" ends up in main gtkradiant folder, so one may assume everything under it and its sub-folders (including other .game folders) is gpl... while we don't know. You don't edit anything in local.conf. The paths must be set in games/oa.game. About the COPYING file, good point. Still I want to create a barebones entities.def/ent file, so original help text can be added and we can get a fully-GPLv2 pack out. I have looked attempted to create a barebone entities.def. Not only have I attempted. I believe to have succeeded. And not only do I believe to have succeeded. I believe that my solution can be considered "good" or even "very good". It is also attached to this post. Some other files (textures, shaders, project files) are required as well. They should be easier to make as they contain very little original content. I do wish that the def-format can be converted to a transformation friendly format like properly tagged XML but that is a task for another day. Feel free to clone https://github.com/OpenArena/gamecode and improve the comments! long time not here, but today i thought about finishing my last map attempt. Unfortunately i deleted my fine GtkRadiant installation with all the tuning i did. So i have to start from scratch and i wonder if there is a complete comfort-file to just extract and beginn mapping for oa? I do not like to pull all neccessary files together by myself. Some kind of "gtkradiant.1.6.4_with_oa_stuff" would be great. For GTKRadiant 1.6.4, perhaps Sago's def file from the post above yours may help? I found GtkRadiant 1.6.x harder to setup compared to NetRadiant. I used the Q3-package with my entities.def file from a few posts back. I ended up copying some pk3-files into the baseoa folder to get it to work otherwise it just crashed. Thx 4 quick response (as usual) and glad 2 c that some of u r still her! Installing the radiant and create a subfolder for oa. Copy all files to this folder and get to work. I started by copying Q3Pack and for 1.6 I copied the baseq3 files into the openarena install dir. Apparently there are some textures and shaders Radiant need but I did not have the time to figure out why. It possible only need a single file somewhere. I made it, but it was a hard peace of work (maybe i will explain later how to install GtkRadiant for oa in a detailed post). Regarding the shader problems: Gtkradiant seems to be unable to locate the shaderlist.txt if this file is just in a pak-file. if you extract the file from the pak0 it works fine. _but_: the pak0-file isn´t complete. it lacks some shaders from other pak-files (as far as i can see). That's because a lot of stuff was separated from pak0. IICR there's a more complete shaderlist.txt in the latest patch. All the work broke my brain and i gave up, because it is to much work for a guy, who just wants to create a map. Maybe someone else is able to make a pack for the new radiant version, so other mappers will have the ability to make a map. Why don't just using NetRadiant 1.5, with the OA package Neon Knight did last year? I bet, the implementation of the pack is nearly as complex as it was for GtkRadiant 1.6.4. Unzip the file to a place you like. Remove the unneccessary XXPak folders inside the folder called "installs". You just need the folder "Q3Pack". Start radiant.exe and select the game directory of you OA-installation. Click OK and wait a few seconds. GtkRadiant will start and prompt you to select a game. make a copy of the q3.game folder and rename the new copy as "oa.game". inside of the folder you will find a file called local.pref. open this file with an editor and search for "baseq3" and replace with "baseoa" (there should be just one place with "baseq3"!). now make a copy of the file "q3.game" inside the "game" folder and rename the copy to "oa.game". open the "oa.game" file and modify the quake related entries. now you have to have a subfolder inside the "installs" folder called "OAPack". Just make a copy of the existing "Q3Pack" folder. Inside you new "OAPack" folder you will find the subfolder "install". he contains 3 folders, "docs" and "missionpack" can be deleted! you also have to delete the both files "common-q3map2.pk3" and "curry.pk3". from the remaining file "common-spog.pk3" you just need the subfolder "radiant" with its files. 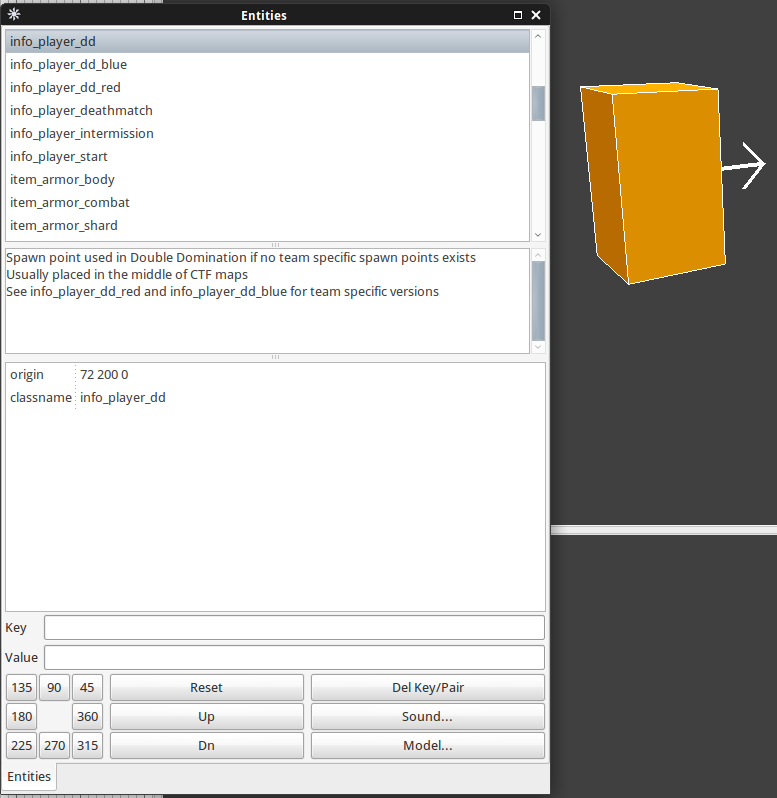 you can unzip "common-spog.pk3" and remove the "common" folder inside the newly created "textures" folder. the texture folder also has to be put inside your oa game folder (inside "baseoa")! now switch to your openarena directory and grab all files starting with with "PAK" andf copy them to the folder "\GtkRadiant\installs\OAPack\install\baseoa\". The user0.proj has to be modified: replace all q3 related path information to oa. important: there should be an "OAPack" reference which also has to be modified. next you can start GtkRadiant and enjoy mapping after the selection of OpenArena as your game. important note: GtkRadiant seems to be unable to locate shaderlist.txt inside PAK0 properly. so you have to make your own shaderlist.txt file and place it inside the "scripts" folder. entities.def file could be used from sagos download. It is not finished yet, maybe someone else likes to complete the guide and make a final package of his work. Just got GTKRadiant 1.6.5 to run in Linux and recognize OpenArena as a game! Here's the gamepack. Do the same as always: unzip and replace paths where needed. Just a heads-up: I've created a repository for the gamepack. This way we should be able to work on a properly GPLv2 gamepack. It should work with both GTKRadiant 1.5/NetRadiant and GTKRadiant 1.4/1.6, but feel free to point out problems. For people who just want to download the gamepack, they can do a "Clone or Download" and extract the contents on the Radiant dir.